Just when things had seemed to calm down in Hawboro after the recent unpleasantness concerning the Zebulon Zebras, a new theater company announces plans to develop a play to celebrate the town’s sesquicentennial. As they probe the official story and rehearse the drama, the contemporary concerns of the artists and the community begin to parallel the struggles of the city’s first citizens. From Reconstruction to Black Lives Matter, the line between the present and past, rehearsal and reality begins to blur as new truths emerge and tempers flare. In the tradition of Common Enemy, this world premiere drama returns Triad audiences to the town of Hawboro for a bold exploration of the contemporary South. Contains adult language and themes. A night of true stories about the modern South. A discussion on playwrighting and Actions and Objectives. An ice cream sundae bar and an inside look at this World Premiere production. An Opening Night pre-show reception. 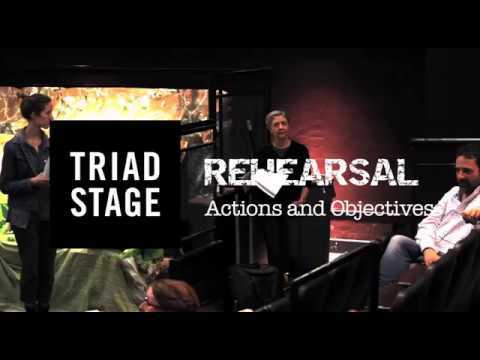 Triad Stage - Cinny Strickland and Carroll Michael Johnson in Actions and Objectives. Photo by VanderVeen Photographers.Triad Stage - Lisa Kitchen, Zachary Vinge, and Neila K. Ettienne in Actions and Objectives. Photo by VanderVeen Photographers.Triad Stage - The cast of Actions and Objectives. Photo by VanderVeen Photographers.Triad Stage - The cast of Actions and Objectives. Photo by VanderVeen Photographers.Triad Stage - Aundria Brown in Actions and Objectives. Photo by VanderVeen Photographers. Preston Lane’s newest play, “Actions and Objectives,” may be based in the fictional town of “Hawboro, N.C.”But with its debates over Confederate memorials and the fictionalization of the Civil War, it could be Reidsville. With the woes that it depicts in a town whose economy is struggling to regain its footing after the decline of a bedrock industry it could be Eden or High Point or Kannapolis. With its reference to the fallout over the mixed legacy of Gov. Charles Aycock, it could be Greensboro. In the director’s notes from his new play, “Actions and Objectives,” Preston Lane observes, “A writer writes from what (he knows).” Right away, you know this play from the prolific Lane is his perspective of race, relationships, power structure, of events current and past, and truth. But Lane is also a teacher and was 2016 artist-in-residence at UNC-Greensboro. Writers write; teachers teach; and when you’re both, you find a way to combine the two. The world premiere of a play in Greensboro Friday shines a light on race relations and other hot button topics. There aren’t many 11-year-olds who can say that a playwright wrote a part specifically for them. But Aidan Armstrong can. Preston Lane, a playwright and Triad Stage artistic director, originally didn’t have a child’s role in his latest production, “Actions and Objectives,” but he created one specifically for Armstrong.